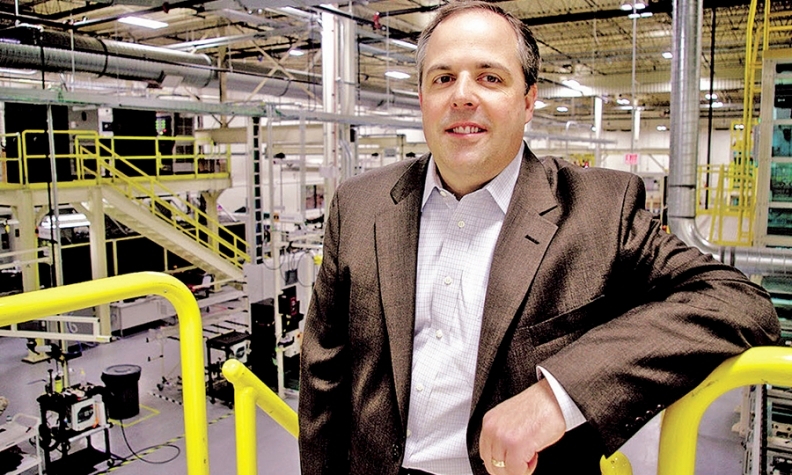 A123 CEO Jason Forcier said he is focusing on starter batteries. DETROIT -- Outside the entrance of battery maker A123 Systems' suburban Detroit headquarters, a gray Fisker Karma sits next to a battery charger. At first glance, that might seem like a sign of things to come. Because China's Wanxiang Group owns Fisker and A123, one might expect A123 to provide lithium ion battery packs for the to-be-revived Karma. But A123 CEO Jason Forcier said he is focusing on starter batteries instead. Since Forcier was named CEO in 2013, he has concentrated on lithium ion starter batteries and batteries for microhybrids -- that is, vehicles that require small batteries to power start-stop systems and store electricity from regenerative brakes. Those products have caught on, Forcier said. This year, A123's revenue is expected to top $300 million, up from $200 million last year. Forcier, a former executive of Lear Corp. and Robert Bosch GmbH, joined A123 in 2009. After he was named CEO, Forcier decided to shift the company's focus away from electric car batteries. His new business plan was straightforward: Feed big battery packs to China's EV market, and focus on small batteries everywhere else. Today, his two factories in suburban Detroit are running full tilt to produce starter batteries for Mercedes-Benz, and Forcier expects to launch production of microhybrid batteries in 2017 or 2018. Lithium ion batteries remain pricey, but costs are declining as rising production allows economies of scale, Forcier said. When 12-volt batteries for microhybrids debut in three or four years, they will cost about $300 apiece, Forcier said. That's roughly three times the cost of equivalent absorbent glass mat batteries, which are a popular option for start-stop systems. Despite their high cost, lithium ion starter batteries are establishing a niche because they are much lighter than lead-acid batteries, and aren't damaged by frequent recharging. While Forcier is betting on starter batteries, about one-fourth of his revenue still comes from battery packs for electric cars. A123's battery factory in Hangzhou, China, is running at full capacity to supply batteries for electric-powered buses and cars, Forcier said. And Forcier may get some added EV battery business from Fisker, which may resume production in mid-2016, Reuters reported. "I'd love to have them as a customer," Forcier said. "We will support them in any way we can, but that doesn't mean they have to use our battery." Given the history of Fisker and A123, Forcier's caution is understandable. During its brief existence, Fisker bought its batteries from A123, which also owned a stake in the automaker. A costly battery recall helped drive A123 into bankruptcy in October 2012, followed by Fisker the next year. With or without the Karma contract, Forcier said he won't change his company's focus on starter batteries. "We won't spend too much effort on the EV markets in Europe or the U.S., because we don't see them as viable markets in the next 10 years," Forcier said. Meanwhile, two industry giants, LG Chem and Samsung, are eyeing the market for lithium ion starter batteries, Forcier said. But Forcier said he's optimistic about his company's prospects because of the deep pockets of A123's corporate parent, Wanxiang. Forcier said: "Our parent has been investing, and our financial concerns are gone."